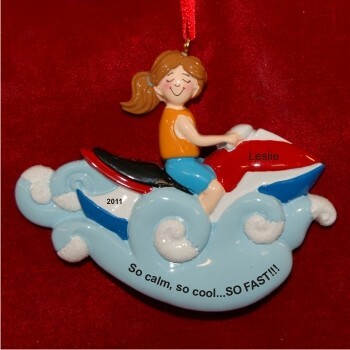 One of the cutest jet ski ornaments you'll find anywhere, the brunette female jet ski personalized Christmas ornament features a fabulous design from the frothy rolling wake to the adorable gal at the helm. Replicated in quality resin from a hand-carved model, these hobby ornaments personalized from Russell Rhodes are hand lettered in an attractive font with the custom details you provide us with. 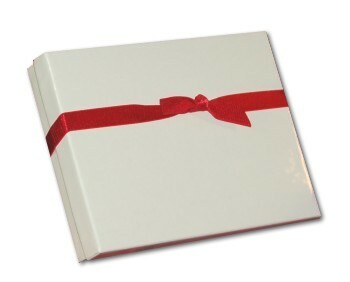 A display cord allows her to hang the female brown hair jet ski personalized Christmas ornament wherever she likes it best, and it arrives in our beautifully plush velvet gift pouch. Put a smile on your aqua-adventurer at the holidays or before the first ride of the year with this super cute decoration!